1970 Jackson Egg. 5ft 5"
Foam blank with black glue line stringer. Volan glassed with tinted bottom, Vee tail patch and foil fin patch. Resin pin lines.
' Designed and Shaped by Laurie 'Froggy' Byrne.
' Designed and Shaped by Laurie Froggy Byrne. embellished coloured foil at sweet spot. Deck: clear with blue tint laminated Vee dtail patch and rail overlaps. Red resin pinlines. Nowra tip, March 2000. Paul Flack Collection. Damage to nose bottom and fin tip. COMMENTS: Early shaper decal of the 1970's. 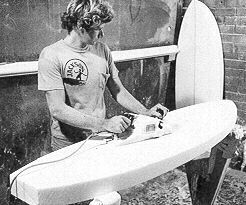 Margan and Finney: Pictorial History (1970) pages 198-199.
where he shaped many boards for Tom Carroll. Photograph courtesy of Jackson Surfboards. Printed in Margan and Finney: Pictorial History (1970) page 198. Other photographs in this section (Making a Board) include the above decal, page 199.